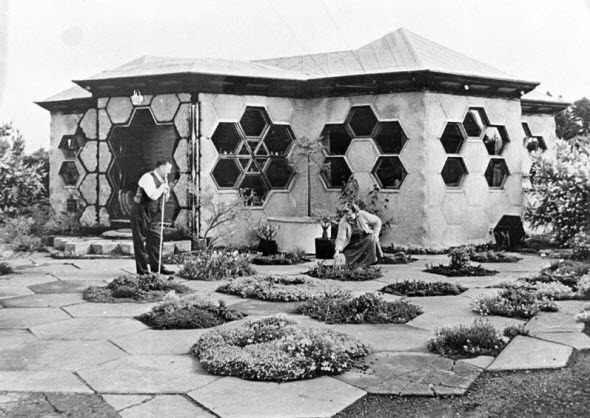 When I was at primary school in Waitara we went on a field trip to visit a hexagonally-designed house belonging to a family of bee-keepers, the Brewsters. To say they were fixated by by all things "aparian" would be an understatement, but is turned out to be one of the sweetest trips of my childhood. Honey tasting certainly has a lot to commend it. As a seven year old I learned for the first time that the tins of honey we got from our local bee-keeper were just one variety and that there were several more that could be enjoyed. It just depended on what flowers the bees were visiting at the time. In this age when the properties of New Zealand's manuka honey are known throughout the world this revelation might seem a little strange, but at the time the darker honeys such as manuka and rewarewa were regarded as second rate to the creamy white clover honey. The facts that bees could starve in winter and were fed supplementary sugar syrups to see them through was another fact I learnt at the time. But the information that resonated most and has stayed with me all these years, is that the drones (male bees) are kicked out of the hive in Winter and die. As a young male of a different species I wasn't so sure that this idea was a good one; being surplus to requirements was not something I had ever contemplated before. This then was my first exposure to the word "drone" and its deathly connotations. Regrettably in recent years the term has come to be associated with high tech weapons that reign down death on the unsuspecting. Am I alone in thinking that there is something inherently immoral in this type of warfare. That a technician in the USA, or a country neighbouring a trouble spot, can monitor and wipe out a target from afar might seem a clever solution. After all, the attacking party faces no risk as the drones are unmanned. The problem is of course that this is an indiscriminate act of war. 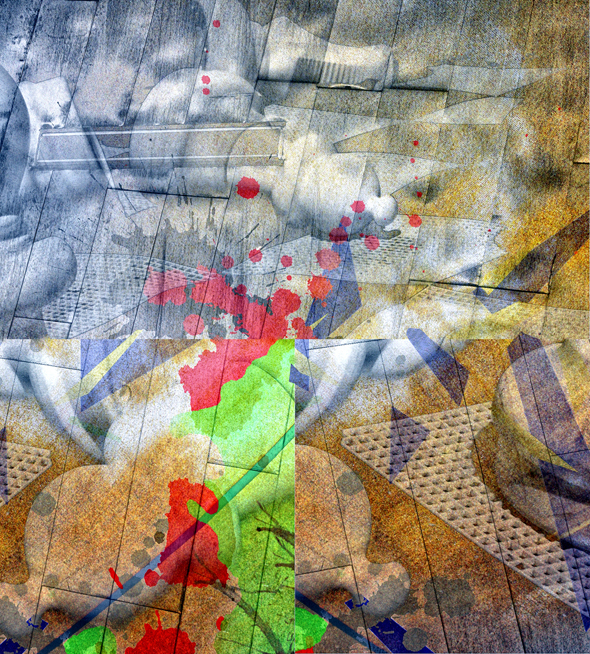 The targeting can be anything but, and prone to human error. It might save a soldier's life who is delivering the payload but it has often ended the lives of innocent civilians in the process. 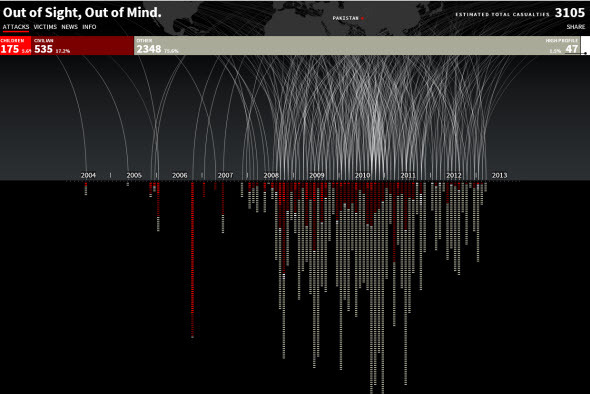 I came across this sobering visualisation which shows the proliferation of drone attacks from the first recorded on in 2004. Drone manufacturers are now facing an increased challenge as the US Military scales back its operations. Increasingly they are turning to the manufacture of industrial and civilian drones to boost their profits. As the ABC reports some of these flying machines are as small as a humming bird and can steer water and pesticides to crops with precision, saving farmers money while reducing environmental risk. They can inspect distant bridges, pipelines and power lines and find hurricane victims stranded on rooftops. And they are a boon for the would-be spy as the miniaturisation of technology means that they can be manufactured to actually look like insects and hummingbirds. One such device even made it to TIME's list of the top 50 inventions for 2011 (see video below). Privacy (or the lack of it) from these civilian drones is a major issue. The US is moving to legislate their use and if you thought the recent News of the World media spying saga put journalism in the gutter, just think what drones will do to our private lives. According to another recent ABC News report, professors at the University of Missouri have started a “Drone Journalism Program” to teach their students how to use drones as reporting tools! As I write the season of winter is approaching the southern hemisphere. I can't help but thinking that maybe the bees have the right approach when they force their drones out; sending them to a seasonal and certain death. Perhaps man can learn a thing or two to from nature after all. It is only fitting that a country that relies so much on its rivers and waterways should have a new exhibit - the River Safari. Due to open in a week's time, the River Safari will be a companion attraction to the much-loved Night Safari and will link it with the Singapore Zoo. There are eight distinctive freshwater habits portrayed in 69 exhibits; all of which the public will be able to enjoy. The undoubted hit in the new Safari will be the Giant Panda Forest, the largest panda exhibit in South East Asia. It features the giant pandas Kai Kai and Jia Jia which were gifted by China to Singapore. Quite apart from the tourist potential I can't help but think what a wonderful educational resource this will be. If you consider the nature exhibits that Singapore now has in total, the younger generations should be well attuned to the natural environment by the time they reach adulthood; Gardens By The Bay, the River and Nights Safaris, S.E.A Aquarium in Sentosa, Jurong Bird Park, the Singapore Botanic Gardens and the various marine and terrestrial ecology walks that dot the Island. Add to this the new Lee Kong Chian Natural History Museum that is being built at NUS. Visitors and students will be able to see 800,000 South East Asian specimens and the nearly complete fossils of three giant dinosaurs. All in all a natural history "feast" for nature lovers and without doubt a magnet for eco-tourists. And this market segment is significant. As far back as 1993 the WTO estimated that nature tourism generated 7% of all international travel expenditure. By 1998 the same organisation estimated that ecotourism and all nature-related forms of tourism accounted for approximately 20 percent of total international travel and by the year 2020 their would be 1.6 billion international travellers. International tourist arrivals surpassed 1 billion (1.035 billion) for the first time in history in 2012. Coupled with Singapore's Eco-approach to building and public spaces sees the country rapidly becoming the globe's Green Magnet, attracting eco-tourists from far and wide. Suffering from "makan withdrawal" symptoms? This could be the device for you. The ideal going away gift for a colleague or friend. Get yours here. 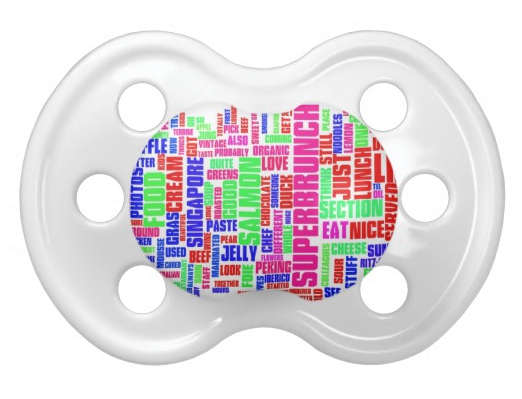 And yes, you could gift it to a baby if your really wanted to! They all laughed at Christopher Columbus when he said the world was round... or so say the lyrics of a popular song. There was equal hilarity whenever I raised my small umbrella to beat off the Singapore sun. My colleagues used to rib me about this practice but I found it a good way to circumvent 'mad dogs and Englishmen' syndrome. While certainly not trying to emulate a Tai Tai with her parasol, my small 'brolly with its silvered reflective upper panels worked a treat. The heat of the noon day sun in Singapore is unmerciful and even the locals wisely avoid it if they can. Apparently, and according to the same source, black ones do even better, blocking at least 90 per cent of rays'. Now I find this somewhat surprising as my rudimentary physics lessons from high school days drilled into me that the colour black attracts heat while white repels it. The report went on to note that 'the handheld umbrella (HU) is a commonly employed method of sun protection by women in many countries in Asia (45% in China) and the Middle East. In Turkey, hats and umbrellas were found to be the most common photoprotection accessories. In the 18th and 19th centuries in the United States and in Europe such umbrellas were standard outdoor accessories for women, but by the 20th century sunscreen, hats, and sun-protective clothing had taken over. As we have become more aware of the harmful effects of UV, the hand-held umbrella is making a comeback. In both Australia and New Zealand the incidence of skin cancer is particularly high but in both countries it is rare to see a hand held umbrella being used as protection, unless of course it is a new immigrant from Asia. Large beach umbrella when basking in the sand have been the norm for decades but they hardly qualify as being 'sun smart'. I content myself in the knowledge that I was ahead of my time when I first raised my umbrella for a stroll down Tanglin Road! 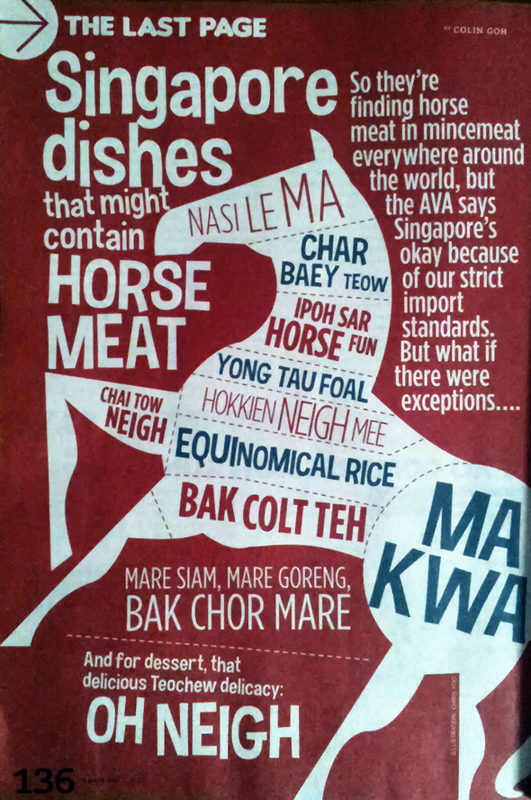 Some Singaporean wit to start the day. I am grateful to a friend for sending it to me. It also reminds me that we often dined at IKEA in Alexandra Road. IKEA had to recall its meatballs and other products as the'beef' turned out to contain horse meat as well. To top it off, some of their cakes in Europe were found to have been contaminated by faecal matter - not a good look. Addressing the situation in true marketing style they have now re-introduced their meatballs to the Singapore menu at ten cents a piece. I wonder what discount you can get on the cakes? Stop Press: IKEA has set a record in Singapore when it resumed selling its signature meatballs here, it said Saturday. The furniture chain said it sold 249,375 meatballs in a single day on Friday, which is believed to be the Singapore record for largest number of meatballs cooked and sold in a day. The 249,375 meatballs are estimated to weigh four tons in total. IKEA elegantly returns meatballs to our dining tables, at 10cents a piece today!